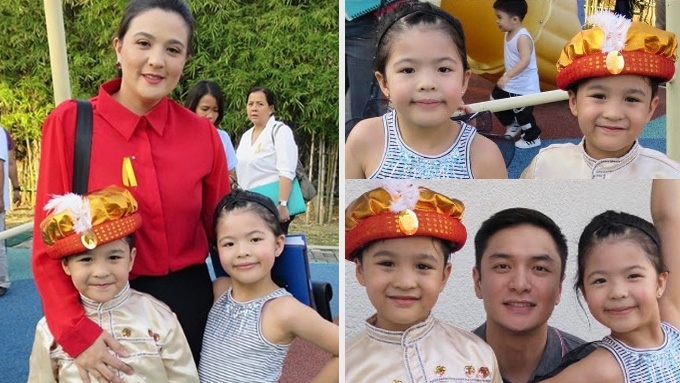 Netizens were surprised to see Sunshine Dizon and her estranged husband Timothy Tan together at their kids' moving up day in school. The estranged couple were first seen together when they celebrated their eldest child Doreen's moving up day last March 13. Later in the week, Sunshine and Timothy got together again for their son Antonio's own celebration on March 17. The Kapuso actress posted photo collages for Doreen and Antonio's academic milestones on her Instagram and both posts included Timothy's photo with the kids. Netizens were pleasantly surprised with these recent developments in the wake of the couple's rift because of their marital issues brought about by Timothy's infidelity. Back in December 2016, Timothy issued a public apology to Sunshine and their kids. In return, Sunshine accepted this apology but clarified that there has not been any reconciliation between them. On January 5, 2017, Sunshine withdrew the charges she filed against Timothy and his mistress Charisma Sison and filed for an annulment instead. "I think I owe it to myself already to be free of all these." she told PEP.ph (Philippine Entertainment Portal). "Marami pong bagay sa buhay na kailangan nating tanggapin na hanggang dun na lang talaga. "Ang importante sa akin ngayon is ma-save ko yung konting maibibigay ko sa aking mga anak." With fans spotting Sunshine and Timothy together, they expressed hope that the estranged husband and wife would eventually reconcile for the sake of their children. On the other hand, some simply commended the Ika-6 na Utos actress for her decision to keep her children's father included in important family occasions despite his transgression.